Yumi London Sparkle and Embellished Sweater will update your look instantly. 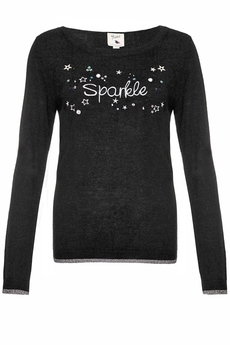 In butter-soft lightweight knit, it features slogan and stars embroidery with sequins and stones embellishment. Has crew neckline and lurex detail hem and cuffs. Is approx. 60cm in length and it simply slips on. Winter collection. Composition: 47% Polyester, 25% Acrylic, 20% Polyamide, 8% Wool. Color: Black.